as good as sailing gets…..
Today was a day to sail across the Bight of Eleuthera. East winds at 20-25 gusting to 30. Course Northwest, sailing angle beam to broad reach. Waves 2-3 on the starboard stern quarter. The ride, smooth and comfortable. The autopilot sailing the entire leg holding the boat on the selected wind angle of 135 degrees, starboard reach. Boat speed ranged from 5-7 knots. We motored one hour in the am to charge up the battery bank, and we motored one hour at the end of the day to run into Current Cut. Island Packets are heavy yachts, but they really sail well in this kind of breeze. Running with our new boat buddies, IP32 MORNING GRACE and IP38 MOONDANCE, we all three had a dream sailing day and a safe passage through Current Cut. Tomorrow we will move 2 hours up to Spanish Wells where we will dock at Spanish Wells Yacht Haven. We need to wait out some unsettled weather, so we have selected to do that at a dock and enjoy the town. We are looking forward to this new destination! Here are a few sailing photos of the 120 pictures I shot today! The beautiful blue water and view from the cockpit. Another great day sailing the Bahamas. This life is so fun, exciting, adventurous and enjoyable. Yes, we live by the weather and we spend too much time working on weather, but planning ahead makes for better passages like today. I published a video of this sailing, but it blew up my BTCbahamas data plan when I tried to upload it. So I bought more data. I will try again tomorrow…..Data down here is $30 for 2 GB for 30 days only! I have only used 2 GB since March 1, today starts my second 2 GB plan. Not bad for all the blogging, photos and emailing I have been doing this month. The waterfront building waiting for a rebuild…. While riding out the high winds from the gale up north and waiting to move on, Eleuthera is a great place to stay. Free water on the beach at a city tap, public pavilion for local events and cruiser gatherings, great grocery store, hardware store, service station and laundry with nice cafes and even a blue hole to explore. This harbor has a lot to offer the cruising sailor and it is easy to stay here. Now after 30 knot winds on anchor, we will sail the 20-25 knot winds northward through Current Cut and on to Spanish Wells. There we will need to ride out the next cold front on Saturday and Sunday. It has been a very windy winter and tough to move around at times. We are always looking for safe harbors….. Check this $78 bilge float switch! Good Friend Steve on IP38 SLOW FLIGHT. He makes great rum cake! Look, a gas station, hardware store and grocery store! Radeen strikes a pose at the Ocean Hole, 600+ feet deep! Next stop is a town new to us, SPANISH WELLS, on the northern tip of Eleuthera, where we will spend a few days exploring a prosperous fishing village. We have about 300 people a day visiting our blog and enjoying our trip. Thank you again for sailing along! The sail from Cambridge Cay to Eleuthra is about a 45 mile leg, and usually a good sail. Today, we were expecting to motor the passage because the forecast was for light and variable winds. We departed at 0730 and raised sails in Cambridge Cay and found a beautiful 12-15 knot reaching wind on our port beam. So, we had a wonderful sail for about 3-4 hours until the winds moved NE and ended up light and 30 degrees off out port bow which we can not sail. So we left the sails up and fired up the engine and motor sailed the rest of the way into Rock Sound where we dropped anchor. The winds are to build from the southwest tonight and blow 25-28 knots all day tomorrow, so we anchored off the western shore of this massive 1.5 mile by 3 mile harbor. If we want to run the tender to town, it would be a 1.5 mile run from this side of the harbor. So, we might just hang out here until the winds move NE. When that happens we will then pick up anchor and move the 1.5 miles to the other side of Rock Sound where we will be right off the town dock. There are about 15 boats anchored in here for the weather, and about 6 or maybe 7 are Island Packet Yachts. So, it looks like an IPY minivous! As for our weather, THIS IS what it will do Tue and Wed, this is showing 25-30 knots of NW winds. This is WHY we anchored on the WEST side of the harbor. Look at this area with satellite…. This is truly the most beautiful seascape on earth….hands down. #1. The endless variety of colors of blue water, the beaches, the reefs, the mooring field, the Exuma Land and Sea Park management all make it a wonderland. It is simply too beautiful! I can’t even get close to capturing the beauty in my photos. I tried to capture it by shooting over 300 photos in 2 days using filters, polarizing filters and even an underwater GoPro camera. Nothing captured the true scene. You need to add this spot to your Bucket List of destinations! Here are my best 12 photos, of 300+ taken! Beaches, Beaches, Beaches, and no one on them! Black Point Settlement is our identified southern most point, as we only have 3 weeks to explore these islands of the Exumas. This is the second largest settlement in the Exumas with 200 residents, Georgetown is the largest. Here at Black Point it is customary to visit Lorraine and her Mother. Lorraine opens her home for dinners and cooks the best meals and her Mother bakes the local breads. Rockside is the most impressive laundromat anywhere in the entire world. It is spotless and modern, with WiFi, Cable TV, a store, coffee and pastries. And then there is the view! No laundry has a view like this or a dinghy dock like this. This is the #1 laundry. So, while Radeen did 3 loads of laundry, I had the pleasure of rebuilding the head, you know, the toilet! Yes, stupid us, we had the Island Packet Factory rebuild all hoses, pumps and valves to the head, but did not tell them to replace the 4 year old toilet. Lucky for me, I had bought a new replacement head pump on our last day in Miami. The rebuild was easy, simply a matter of swapping out the pump assembly. While here at Black Point , we enjoyed our first meals out off the boat since leaving Miami 16 days ago. This was a real treat, especially after the yacht services and jobs. We enjoyed Scorpio’s for chicken BBQ with Bahamian mac ‘n cheese and Lorraine’s for lobster tails and rum punches. It was a special treat to have Kathy and Dan of IP-440 Sea Star join us both evenings! Sadly, with only 2 days here at Black Point, we will sail out and north up to Cambridge Cay, back into the Land and Sea Park. Cambridge Cay is reported to be many cruisers’ favorite place with great snorkeling and protection. Spare head pump…a last minute buy in Miami. Good decision! Staniel Cay Harbor is great…. While anchored off Big Majors Spot Exuma Island, we ran the Yamaha 15 hp on our 10 foot AB dinghy back and forth to Staniel Cay Yacht Club for diesel fuel and Water. We jugged this fuel in 5 gallon containers and even when carrying 40 gallons of water, the dinghy would still plane and run at about 20 mph! Cruisers have always told us, you need a 15 hp Yamaha and a fast dinghy to cruise the lower islands and this was one day when it really did the job. If you anchor off Big Majors Spot with the swimming pigs, then it is 1 mile+ around the corner and across the bay to the yacht club and town. With a 25 mph tender, this run is quick and easy and dry! We ran into the Grotto to snorkel, we ran to town for a walk, we ran to the fuel dock for diesel and we ran back to the fuel dock for water. About 4 or 5 trip to town from the anchorage and it was no big deal because of the fast dinghy and high speeds we can run at. I agree, if you are going remote, you need a 10 foot+ dinghy and you need a 15 hp Yamaha 2 stroke outboard. It works very well. At about 2 pm, we picked up our anchors and set sail for a nice casual 10 mile broad reach south to Black Point. Radeen at the PINK store, can you tell where the name came from? Staniel Cay is another must stop visit, it is a beautiful piece of paradise in the middle of the Exuma Islands. Yes, pigs CAN swim, and they do swim right out to greet you as you dinghy into the beach at Big Majors Spot. The locals placed these pigs here and now, today, we counted over 20 little piglets and about 4 large adults. Did I tell you I LOVE HAM?….so if you seen one hanging from our mast as we sail out, you will know why! Besides the entertaining pigs on the sandy beach, there is the must-snorkel THUNDERBALL GROTTO which is accessible at low tide. With the tide down 2-3 feet, the undercut of the rocks open up and you can swim into the cave. The ceiling is open with several holes to the sky so the lighting is spectacular. It was even more special than last year. Very cool place to swim. The coral is also very colorful and the fish are well trained and approach you looking for free food. Some even nip at your hands. On the ocean side of the grotto, there is a low ledge that you can swim under into the bright blue light from sunlight over the cave. Over all, this grotto is a must do swim when at Big Majors and Staniel Cay. Here are the photos of the day. Enjoy. Radeen is a PISCES….she loves to swim! Motor Yacht “LAZY Z” has a three story, inflatable water slide! Another wonderful day in the Exumas. Tomorrow we need to jug a little fuel, 10 gallons, and jug a little water, 50 gallons. Then we will sail 9 miles to Black Point Settlement for much needed laundry and dinner ashore! The USA Flag off Warderick Wells…. Here are a few photos from today, we really love it here…We hope you enjoy the photos. Thank you for enjoying the photos of the most beautiful place in the Bahamas, now on to find more beautiful places…. We can not imagine a more beautiful place to sail into and to spend a few days exploring. Warderick Wells in the Exuma Land and Sea Park is a world treasure like nothing else. The most clear water surrounded by coral reefs, tropic fish, sand bars that dry at low tides, hiking trails to overlooking ridges, no cell phone coverage, minimum Internet only via $atellite$ and no stores, no water, no electric, nothing. You may take nothing but pictures, you may not fish or lobster, you may not shell. You must take nothing, and leave nothing. No trash disposal, no docks, no town, restaurants and no bars. It is beautiful! Today, we slept in on the security of a mooring ball, we baked bread to share, we went snorkeling on two coral reefs and one sunken ship. We walked the sand bar and we took hundreds of photos. Nothing can show the true beauty of Warderick Wells. We really love it here. 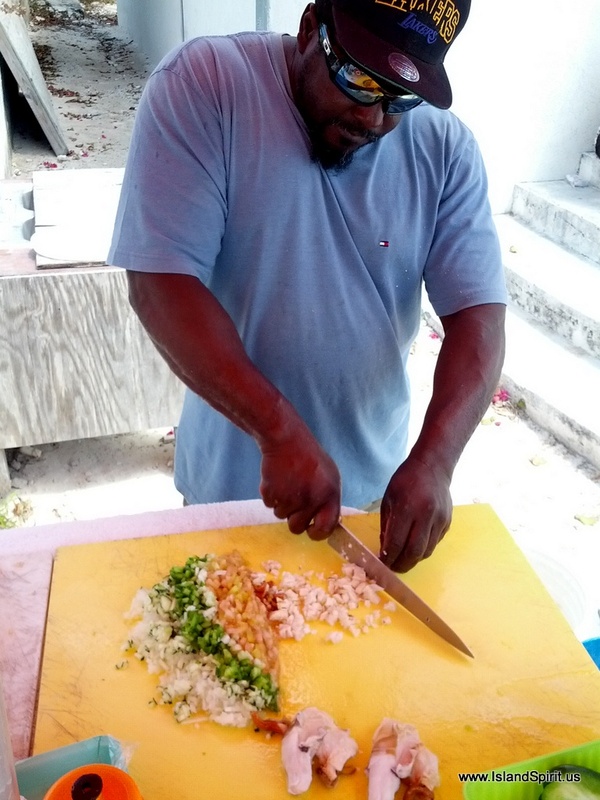 THIS IS THE TRUE BAHAMAS…. So, our first full day at Warderick Wells was a dream day. Relaxing, calm, adventurous, exciting, fun and costs $15…plus $15 for Internet….not a bad value for $30. We will stay here a few more days…..Thank you again for sailing along. Go to Google Maps and search out Warderick Wells, Exumas, Bahamas, then look at the Satellite images of this place, it is so beautiful. If I had the bandwidth and connectivity I would give you a link.